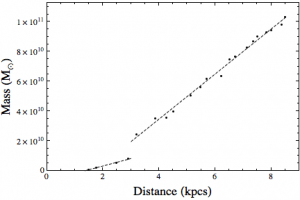 Last time I talked about how hydrogen gas in our galaxy can be observed by measuring the 21 cm radio spectrum, and how we can use the results to determine how fast our galaxy rotates at different distances from its center. Usually such a measurement is used as evidence of dark matter (which it is), but it also tells us other things as well. In particular, it shows us that our galaxy is not just a spiral galaxy, but a particular kind of spiral galaxy known as a barred spiral. 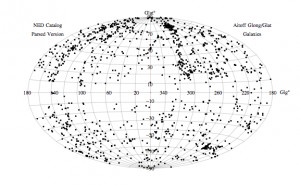 Measuring the 21 cm line tells us how fast hydrogen gas clouds are moving around the center of our galaxy. 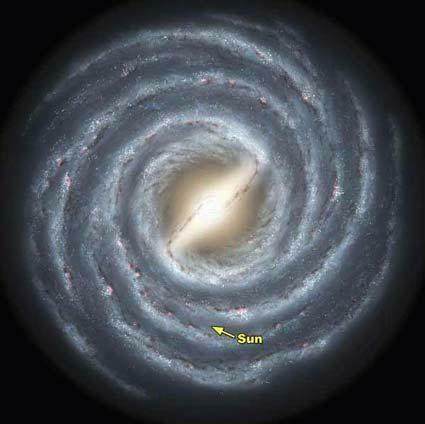 Since our galaxy is shaped roughly like a circular disk, it is reasonable to assume that the matter in our galaxy is moving around the galactic center basically in a circle. If you know a bit of basic physics, you know that if something is moving in a circle there must be a force keeping it in a circle, otherwise things would just fly apart. In this case the force holding the galaxy together is its own mass. Now, the thing about gravity is that for a gas cloud moving in a circle at a particular radius, only the mass within that radius works to keep the cloud moving in a circle. Anything farther out doesn’t really affect things. (This is true in general. If you could dig a hole to the center of the Earth, you’d be weightless there.) This means you can use the speed of the gas clouds to determine how much mass there is within that distance. In the first image above I’ve plotted total mass as a function of distance from galactic center. One thing you might notice is that at about 3 kiloparsecs there is a jump in mass. This type of jump is exactly what you would expect if our galaxy is a barred spiral. The second image is a NASA drawing of what we think our galaxy looks like (a barred spiral). You can see that there’s less matter in the center because of the central bar. 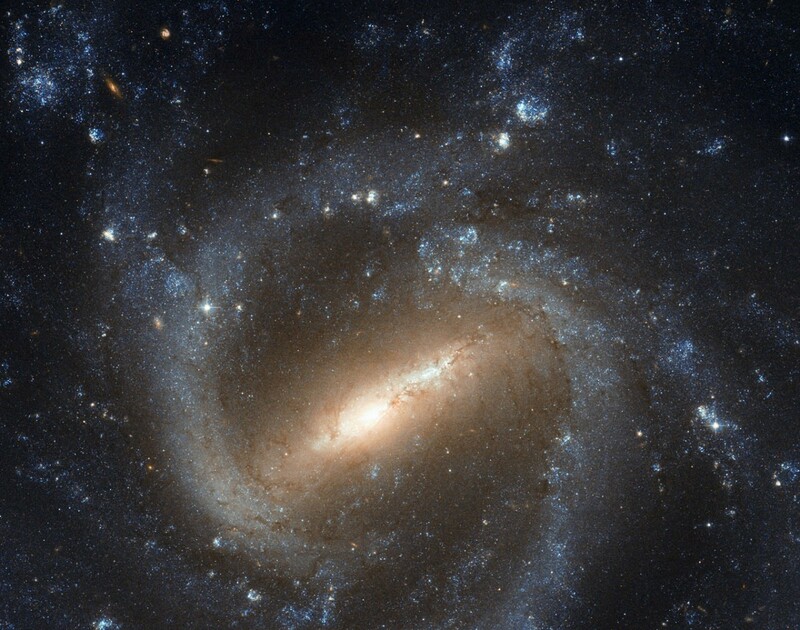 So by observing the motion of hydrogen in the galaxy we know that our home galaxy has a bar, just like about 2/3 of the spiral galaxies in the universe. But what causes the bar? Could that have something to do with rotation of the black hole?